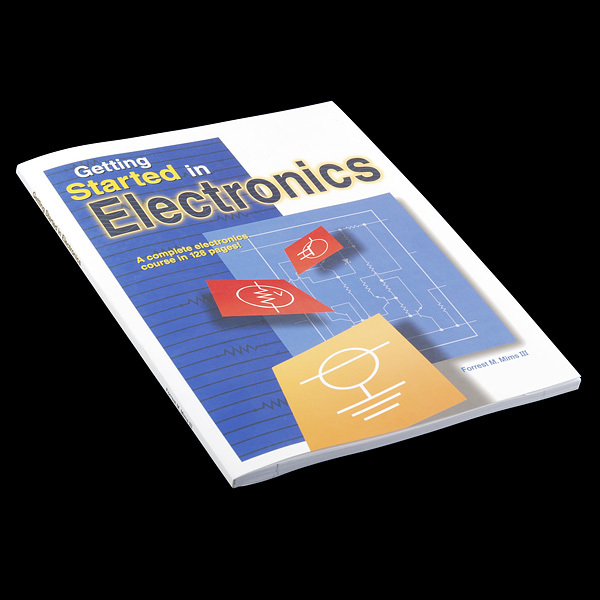 This book is a complete electronics course in 128 pages! Author Forrest Mims teaches you the basics, takes you on a tour of analog and digital components, explains how they work, and shows you how they are combines for various applications. It even includes circuit assembly tips and 100 electronic circuits and projects you can build and test. 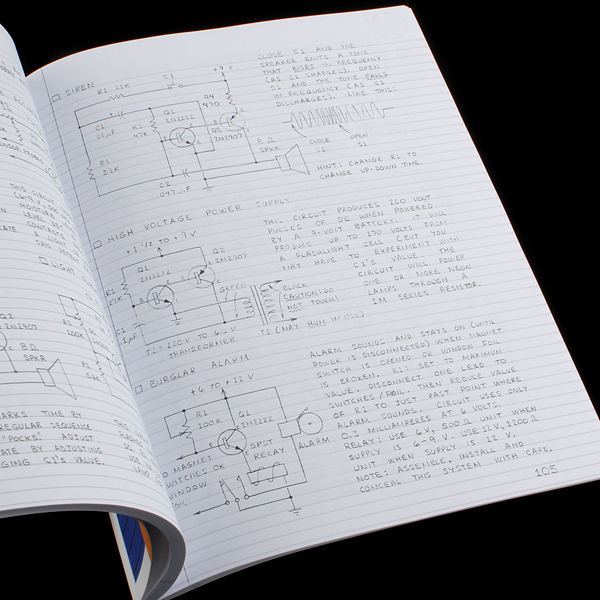 Even if you're not new to electronics, this book makes a great shop reference. I still have the copy of this book I bought in the 80's as a kid! Great for someone just getting started in electronics. 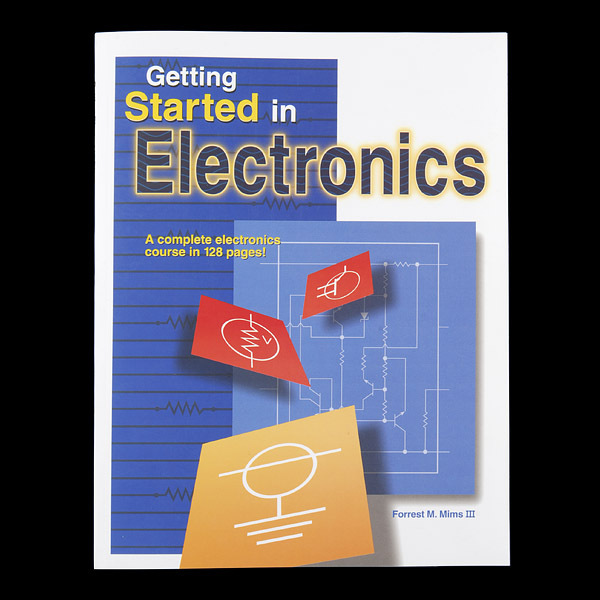 I found "Getting Started in Electronics" when I was 10. That book started a hobby that turned me into an electrical engineer. 26 years later I still keep a copy in my reference library. I've been hoping that Forrest will get around to writing a second edition. That old book is still very relevant, but there have been so many advances that I would love to see them in his classic handwritten "engineers notebook" style. This is a beautifully illustrated book. I may be evil, but I really enjoy the cartoon components exploding after being subjected to too much current. Wow, that brings me back to middle school. I guess I'd have to recommend the book for any electronics noob. For the more experienced, Horowitz and Hill: The Art of Electronics is a standard reference for analog though dated in places with respect to digital. Mr. Mims' book got me started in electronics at the age of 10. The first circuit I remember building was the 0-9 digital counter using a 555, 7490, and 7447. My dad got me that book in 1985 when it was only a few bucks at Radio Shack. I loaned it out, never got it back, replaced it, loaned it out, never got it back, etc. I found an original green-cover copy a few years back on ebay and it's in my permanent library now. I would absolutely LOVE to see him write an updated version, maybe get into microprocessors, etc. This exact book was available FOR FREE at Radio Shack a couple of years ago... I remember getting one from them when I was still in NYC. I read this book and i has the best introduction to digital Logic Chips, Op amps, and transistors. No mention of microcontrollers, probably because it was written wayyy before their invention. This book may seem kind of silly to own if you are an engineer, but it is by far the best beginners book. I bought mine a long time ago at radio shack before it turned into a crappy cell phone store, and I found it way more useful than any of the plastic starter kits. Anyway, its a great go to book if you need to prototype or fix something you forgot to include on your PCB. 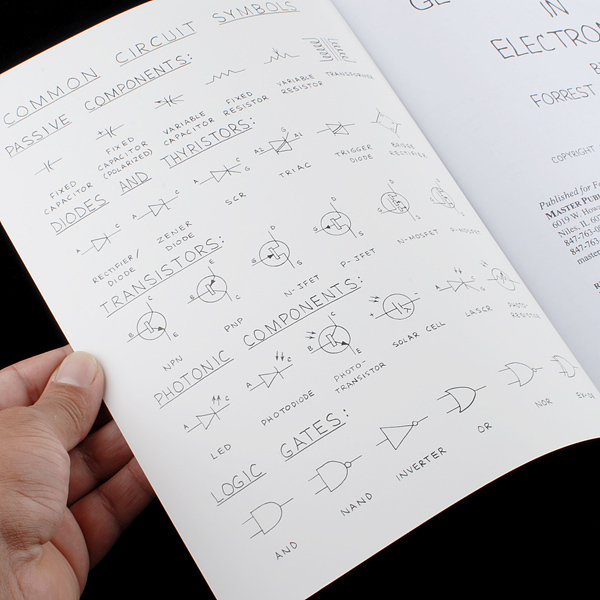 The best part about the book are probably the hand drawn drawings and the smiling electrons. There are also some pretty useful mini notebooks that he has written - but this book is the most comprehensive. Note though this has nothing to to with microcontrollers. This is strictly analog stuff with some digital applications. This book is one of the best intro to electronics books I have ever read. It has useful information on everything from electron flow to solid-state electronics with detailed descriptions and diagrams of diodes, transistors, inductors, relays, etc.. It is still my go-to book when I need to look up a symbol or description for quick reference. You will definitely not be dissapointed with this book. I picked up this book a few years ago and found it to be an enjoyable and informative read. It is unique in that it is completely hand written and drawn too (don't worry, it's legible). I absolutely love this book. Required material for anyone who works with electronics. Do you guys think about selling this as an e-book? It would be wonderful! Buying a book in US (custom taxes) + shipping to Europe is extremely expensive for a book even if the book is very good. This is the guy that wrote the book. Still double the price here, but it may be cheaper than shipping/taxes/customs/etc. Sorry Spark Fun, not trying to loose business for you. I'm sure Kangooooooo will more than make up for it when he buys parts from you after getting ideas from this book!